Pastor Tim graduated from the University of Dubuque Theological Seminary in May 1998. Tim is a full member of the Wisconsin Annual Conference of the United Methodist Church. He was ordained a Deacon in 1997 and as an Elder in 2001. Tim served as a student pastor of the Bloomington and Cassville United Methodist Churches from 1996-1998. His first full-time appointment was at Balsam Lake and Centuria United Methodist Churches from 1998-2003. He served Kaukauna Peace United Methodist Church from 2003-2012. 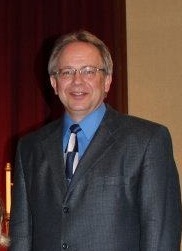 He was appointed by Bishop Linda Lee to Neenah Faith United Methodist Church on July 1, 2012. Pastor Tim is the 70th pastor to serve at Neenah Faith since there beginning in 1855. Prior to becoming a pastor, Tim worked in sales and graduated from University of Wisconsin-Oshkosh in 1984 with a BBA, majoring in marketing. This is what Pastor Tim has to say about his career change..
"It was not that I woke up one day and said I was going into the ministry. I had periodically talked about ministry many times through the years prior to that, even as a small child. There were always other things to do. However, I will always remember what one of my pastor's said (it seemed like he said it every Sunday). He said if God is talking to you, you have to listen! Well he had been talking to me for a long time. I just had a listening problem. There was a peace that I did not have. But, God is still good! He prepared me with ten years of life experiences before entering seminary. Those experiences have been a blessing. Not only in talking, listening and helping others but also in understanding the scriptures. That is, how am I living that out? Also, trying to make the Bible relevant to the daily situations of life. God has given me that peace that I had long sought even when some days are tougher than others I know that I am not alone." Come and listen to Pastor Tim sometime soon.